I am home from work today, more about that later, so I thought I would show you this baby blanket hot off the hook. I seriously finished the last row this morning. The early morning sun is washing out the colors, so think of them as slightly more intense but still very soft. Made with Berroco Modern Cotton and a size I hook. The gray is #1608 Gadwall and the pink # 1610 Brenton Point. 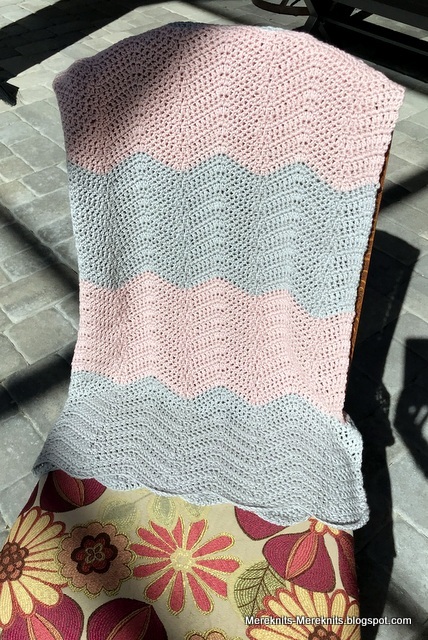 About 1,000 yards of yarn were used to make this blanket, three skeins of gray and two of the pink. Again I used a simple 14 stitch ripple which should have made this up pretty fast, but with my lack of time to make it it took almost a month to finish it. I have already been shopping for this baby girl who should arrive in June. I believe her name will be Reagan. I hope this blanket will be used with love. 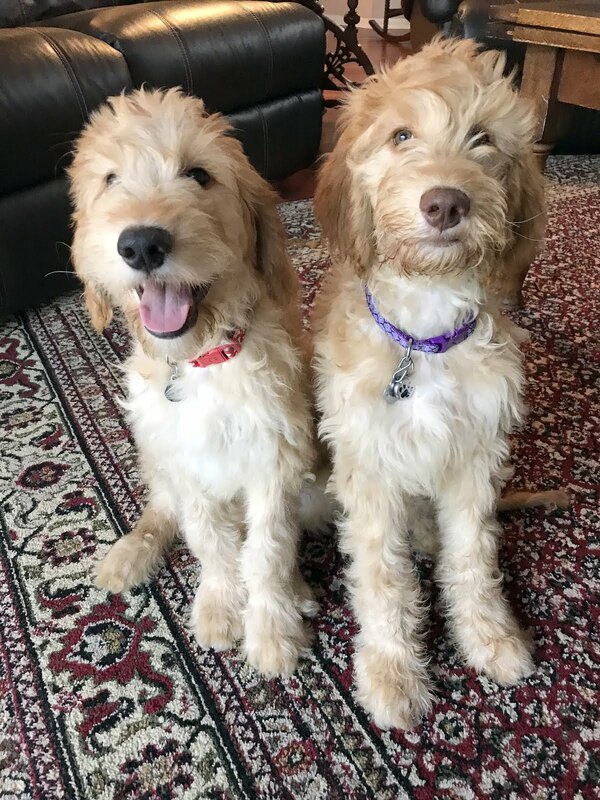 After the anniversary puppy incident I have to say the weekend did not get a whole lot better. Try giving the dogs medicine through a syringe to coat their bellies twice a day. Speaking of bellies, Little Buddy's was upset and he had yet another throw-up-fest after dinner on Saturday. He gets them every few months yet I am always caught off guard when they happen. He still was not himself yesterday, and even though he ate this morning he was still a bit sensitive. My husband and oldest boys are in Kansas to see a basketball game, and I would be an hour away from Little Buddy's school if they called and he was ill. Frankly as I was getting my lunch ready for work, still contemplating what to do, I almost start to cry. And if you know me at all that just isn't me. I really think I just needed a break, alone for a few hours at home just by myself. So for once in my life I actually took a mental health day. Well I do have a wee cold so there is that too, and no voice, but staying home was all about my mental well being and being close to Little Buddy if he needed to come home. I think as women, mothers, working women, wives, daughters and friends we always put ourselves last. I know I have and that is not the smartest thing to do. So for once in this crazy life of mine I decided that it was not worth the money, the driving, the stress that would surely occur especially after last week, to go to work. I can't do this often, probably not even again this year, but for today I did and I have to say I am kind of proud of myself. The furry boys and I have finished Season 1 of The Marvelous Mrs Maisel, I finished the blanket, I have things to make a quick dinner, I have rested my mind and have just been alone. It has been wonderful and frankly now that I have done it I could use a few more days! Just for fun I found some of these photos of Little Buddy when he was very young. He wasn't even living with us in the first two. Look at that very concerned face, and boy was he a drooler! It wasn't so long ago his glasses were much too big for his cute little face. He has grown up hasn't he? He is a delight and the light of our lives, even when he has had a tough weekend. I reminded him that even when he is sick he is loved, and even when he won't stop crying for 2 hours about not going on an adventure he is loved. Even though I wish he was happier and I had to put him in his room for a bit or I was going to lose my mind, he is loved. I hope you managed to recharge yourself. I remember those days all too well. I cried myself to work more than once. 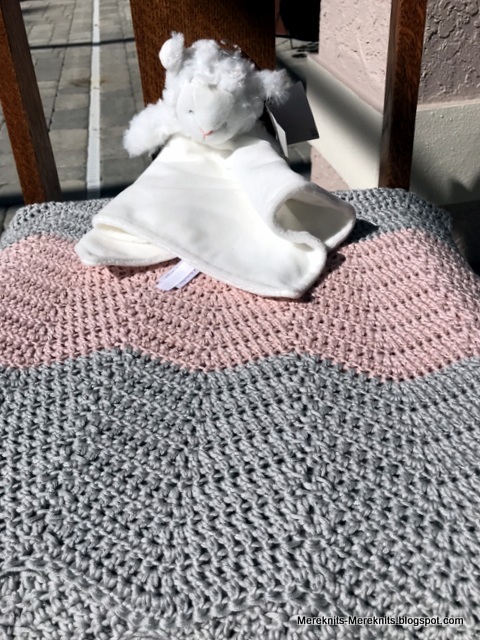 The baby blanket is perfection and your choice of clothes is going to be a big hit. Lucky mom. Lucky baby!!! I am so glad that you took time off and looked after yourself for once. Hopefully you have recharged your batteries and will feel stronger. 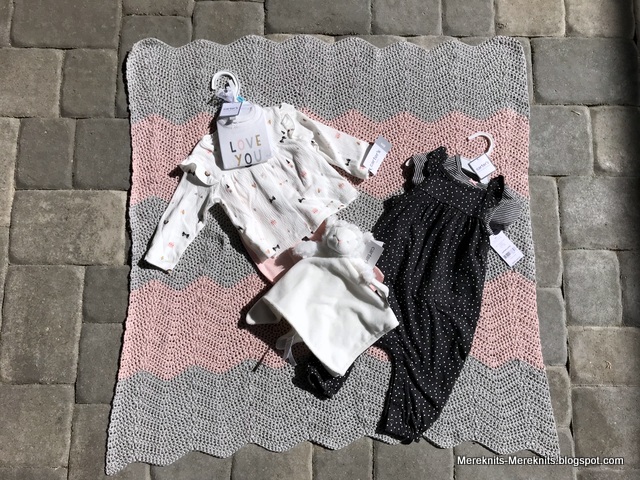 Beautiful blanket and little outfits, another well loved baby. Good for you, Meredith, for taking care of yourself. When I look back at the time when I had my kids home, I honestly don't know how I did it some days. All that stuff about taking care of yourself so that you are healthy to care for everyone else, it's so true. The baby blanket is beautiful. I'm sure mama and baby will love it. Hope he's feeling better soon, he's so adorable. Everyone needs a mental health day from time to time. That little Reagan is going to be one lucky baby! Love the blanket-- I think that most people would like something handmade. I don't work outside the home and my schedule for writing is always a little up in the air...as in I usually do it by the seat of my pants! Still, when there is a day that I don't have to get dressed and look acceptable, I dive into it with joy. Good for you treating yourself. As a mother, you never really do 'punch out', and providing meals everyday is not something you can toss aside. So truly making a point of having a totally different focus on your day is fantastic. Love the photos of Little Buddy way back. He was a as much a cutie as he was then as he is now! 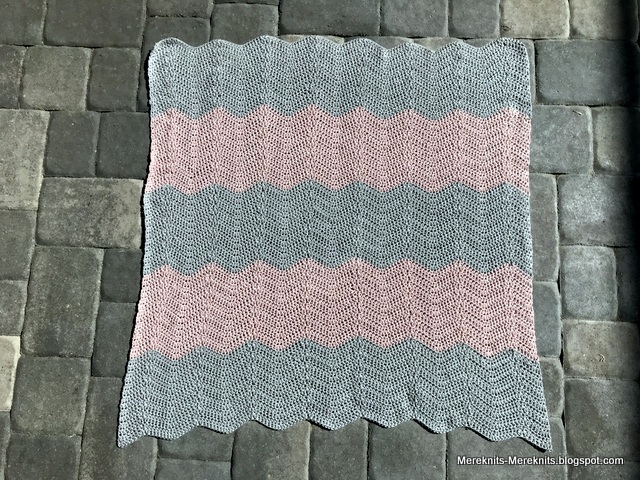 Beautiful baby blanket - will be treasured come June. Sweet 'young Little Buddy' pictures. So glad you took some time just for you Meridith - important. I'm proud of you, too! You devote so much of your life to taking care of other people that it's no wonder that you would need some time to recharge. I would love to take a mental health day now and again, but those days turn into health care after I retire, so I try not to. Plus, I do get my summers off, and that makes a difference. The baby blanket is so pretty. Those colors are very sophisticated together. It will make for a beautiful background for many baby pictures. It was funs seeing the baby pictures of LB. He has always had so much personality! It’s easy to see how that little face captured your heart. Mental health day = self care. Good for you! So much of your life is spent dealing with others' needs. I'm glad you took this day for yourself. It's good that you could recognise that you needed some time to yourself. I think we often plod on in these situations and make it even harder for ourselves. Hope Little Buddy is feeling better soon. The blanket is lovely and I'm sure it will be cherished. See the beauty you can create out of that overworked brain of yours! Little Guy had the throw-ups , too , this weekend; sigh. I'm glad you have provided the umbrella of care he needs! One just has to do that. I think as you get older you realize the fragility of life and ones psyche. Glad you had a day to recoup. Hope Buddy feels better soon. The blanket is sweet. A single day to take a Time Out sounds small, but as women, we know how enormous it is. And you're exactly right: we come too late, most times, to a place in our lives where we finally practice a little Self Care, often at the expense of our own wellbeing. So glad you took the time! If mama aint happy aint nobody happy. SO happy you took a sick day. Mental health days are sick days. They are prevention. Watch your email I'll send something amusing to him. Glad the mental health day helped. Little Buddy ---- OH THOSE EYES! Such big brown beautiful eyes. So sorry Little Buddy has been feeling poorly but very glad you got to have a day to yourself to recharge. That time is so important! I used to take rainy Wednesdays off. Thankfully my boss was great about it as long as there were no pressing deadlines and things were caught up in the office. I'd rent a bunch of sappy movies (back in the day of Blockbuster & video tapes) and stock up on junk food and spend the rainy Wednesday prone on the couch. I always felt SO much better afterwards (if not a little nauseous from all the chips & cookies LOL) and taking a Wed. off broke the work week up nicely. Anyway... glad you got a break! I'm sure your blanket will be well loved! good for you on your day off, you needed it immensely! when you are at your best then you are the best for your family. I hope you take more days off when you can and if you are able!! Little Buddy was a cutie when he was a wee one. Good for you! I hope you are feeling a bit refreshes and will have another me day soon. Little Buddy was always adorable, wasn't he? The blanket is so cute and I love the colors. I like the other gifts you bought as well. Aw Buddy is so adorable in those photos of when he was a toddler. I think we all need a mental health day once and awhile and it is so important to realise when we are overwhelmed and pushing ourselves. I agree that we as women tend to put others needs ahead of our own and it is so important to take time for ourselves to relax in order to refresh and be able to continue on with our busy days. So glad you had that day, it sounded wonderful. First of all, let me say, Happy Anniversary! And secondly, I'm glad the puppies are ok (albeit your bank balance might not be). Thirdly, I love the blanket! Lastly, look how that boy has grown!! Glad you took some time for self care. He always looks so happy to me in the photos...so do your dogs. Tbeir expressions are so joyful. I agree, don't put yourself last. You deserve the best. I read this post shortly after it was published but wasn't in a position to respond with a comment - typing on my phone is no good for my hands and I get too many typos anyway. It was lovely to get online today and see a new post from you showing that LB is feeling much better and able to peel pistachios! Woohoo! He has good taste in snacks too. Loved those photos of LB, Mere. He is so lucky to be a part of your family. That's a lovely blanket also; little Reagan will love it! Hope you have a nice, relaxing weekend. Sending lots of hugs. Good for you for taking a day to yourself! You're right--I think women are hard-wired to put everything and everyone ahead of ourselves. Take care, my friend!